Malanga or Yautia is a corm (modified stem) native to the Northern part of South America and the Caribbean. It is also recognized by the names new cocoyam, tannia, tannier, mangaras, taioba (in Portuguese), amadumbe (in South Africa), etc. Botanically, Yautia belongs to the family of Araceae, a group of decorative plants related to the Philodendron. The corm also called inaccurately as tuber, root, cormel, etc. Apart from the tuber, the leaves of the yautia are also nutritious and edible. Malanga tubers, popular as yautia. The tuber, irregular in shape, is covered with smooth skin that may be covered in hair or small roots, depending on the variety. Its firm crunchy and slightly viscous flesh can be white, yellow, orange, pink or reddish in color. It has a strong, slightly earthy and vaguely nutty flavor. Malanga is high in starch. The plant is a perennial, tropical plant that flourishes on well-draining fertile soil. Several large, shield-like leaves with long, erect ribbed petiole emerge from the stem which stops at the very edge of the leaf at the junction of the two basal lobes of the leaf. The corm is a modified stem which is the store place of starch. Only the laterally borne corms (cormels) are edible. After about 9 to 10 months, the cormels are ready for harvesting once the leaves turn yellow and begin to dry. 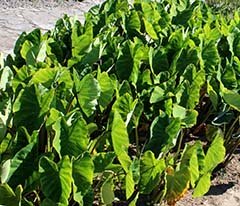 Taro (Colocasia esculenta) is a botanically different plant with similar growth characteristics and corm development. In taro, both the main corm and rootlets (cormels) used for food. Malanga cormels carry more calories than potatoes, but almost same as water chestnuts. 100 grams of tuber provides 98 calories. Their calorie value chiefly comes from complex carbohydrates, amylose, and amylopectin. Nonetheless, they offer modest source of proteins, vitamins and minerals. Together with other tropical staples like yam, cassava, potato, etc, cocoyams too ensure food security to millions in Africa, Asia and Latin Americas. Much like other starch-rich tubers, malanga tuber too does not contain gluten protein. For the same reason, it provides subsitinence source with other non-gluten cereals in people who suffer from gluten-sensitive malabsorption diseases. Starch in yautia compose of slow digesting complex carbohydrates; and together with moderate amounts of dietary fiber, it helps in gradual rise and better regulation of blood sugar levels. Yellow-fleshed malanga and young, tender leaves have significant levels of phenolic flavonoid pigment antioxidants such as ß-carotenes, and cryptoxanthin along with vitamin-A. It also contains good levels of some of the vital B-complex group of vitamins such as pyridoxine (18% of RDA)), folates, riboflavin, pantothenic acid, and thiamin. Moreover, the corms provide moderate amounts of some of the essential minerals like iron (12% of RDA), zinc, magnesium, copper, iron, and manganese. Besides, the root has good amounts of potassium. Potassium is an essential component of cell and body fluids that help regulate heart rate and blood pressure. Cleaned, fresh coms of yautia (malanga) can be readily available in the markets in many parts of the southern USA where sizeable Caribbean population present. On most of the Latin American markets, the tannia is valued as a superior species because of its flavor and texture. Buy fresh, firm, medium size hairy corms that feel heavy in hand for their size. Avoid those with soft spots, cracks, or featuring sprouts at the scales. Fresh corms should be stored in cool, dark, well-ventilated place as in potato, yams, etc. They stay well for up to 5-6 weeks when placed in the refrigertor set at 15 ℃ and 85 &percnt; of relative humidity. In the stores choose firm root with no cuts, mold or soft spots. Make a small slice with the thumbnail to check whether the flesh is juicy. Greens of malanga are fragile. Keep leaves several days in the fridge in a loosely closed or perforated plastic bag. Wipe it with a damp cloth before storing. To prepare, peel the corm as in other tubers and cover with water to remove sticky mucilge. Yautia is only eaten cooked. To cook, boil it for 20 minutes. Boiled tuber can be used as is, as a side dish, or pureed. Also, raw tuber can first be boiled or steamed, then added to a stew or soup at the end of cooking. Generally, malanga employed as a substitute for potato or taro in the recipes across the Caribbean. The tubers used in moderation in the recipes, as their strong flavors overpower other foods. It is grated and cooked in crepes or made into Caribbean style fritters (accras). It is delicious fried or with a sauce. Boiled tuber can be mashed like potato and enjoyed with meat, or vegetable stews. 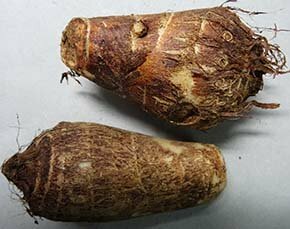 Like taro, yautia are also employed in the preparations of chips, flour, cookie, flakes, etc. In Africa, dried sices of malanga milled and its flour used to prepare fufu, porridge, pancakes, etc. Malanga leaves are cooked in the same way as spinach or used to wrap foods that are then cooked in the oven. Oxalates are the bitter, acrid substances found in malanga cormels, which give astringent and burning sensation when eaten raw. Cooking eliminates these compounds and makes it safe for consumption. Adequate intake of water is recommended to flush out any absorbed oxalates in the cooked malanga. (Medical-disclaimer). <<-Also read- Taro nutrition facts and health benefits. <<-Back to Vegetables from Malanga nutrition. Visit here for an impressive list of vegetables with complete illustrations of their nutrition facts and health benefits.